"Who knows how to find Stephan's Quintet?" "Near NGC 7331 in Pegasus. Let's see if you can find it in your new scope." Fifteen minutes later, I'll hear shouts of joy as someone has bagged his first tough deep sky object. Although the unimpressive view consists of only a few dim patches, this catch has confirmed his finding techniques, telescope optics and visual acuity. Its being a fascinating interacting galaxy group adds to the excitement. Perhaps you've wondered whether there are other lesser known compact galaxy groups which could provide a more challenging test than Stephan's Quintet? One of the best sources for information is Paul Hickson's Atlas of Compact Groups of Galaxies. His original paper in the Astronomical Journal, 255:382-391, 1982 provides catalogue data and identification charts for 100 very compact groups based on a systematic search of the POSS red prints. In a follow-up article in Astrophysical Journal Supplement Series, 70:687-698, 1989 detailed photometric data is presented on the 463 galaxies comprising these 100 groups. To qualify for inclusion a compact group had to meet 3 rigid criteria: 1) population--at least 4 members, 2) compactness--surface brightness greater than 26.0/arcsec2 averaged over the smallest circle containing their geometric centers, 3) isolation--to exclude condensations in rich Abell galaxy clusters. Basic observational data for all 100 compact galaxy groups in the Hickson Catalog, compiled in a user-friendly form by Miles Paul. I found this listing much more useful than the published version. The body of the listing is in basic text format, suitable for importing into popular software programs such as TheSky. By interesting I mean compact groups in which I was able to observe and identify at least three galaxies in a 17.5-inch scope. Of the 74 Hickson groups I have observed, 32 qualify as interesting under this definition. From here you can link to charts and tables for all 32 selected groups. These are the same high power ID charts, based upon DSS images, that Ray Cash, Steve Gottlieb and I use to identify the members of various compact groups. Also included are tables of observational data for the individual members. All charts have North up and West to the right. The charts are to roughly the same scale; each represents an eyepiece field of approximately 15 X 20 arcminutes. 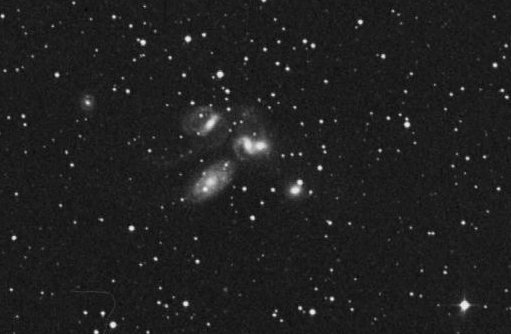 Compact groups of three galaxies didn't qualify for the original Hickson Atlas, but there are lots of interesting ones. Miles Paul compiled this list of 118 of his favorites. Two observing buddies, Ray Cash and Steve Gottlieb, have made a systematic attempt to observe as many Hickson groups as possible in their 17.5-inch scopes. Sometimes I let them do all the work and just enjoy the view. (Having them around is better than digital setting circles!) I can't lend you Ray or Steve, but Ray has collected their observing notes at his Website.